It looks like the relatively mild winter has been kind to the brown-tail moth, and we’re already seeing their little tents popping up across the Downs. The brown-tail moth has always lived and nested on the Downs. Like all of us, it has good years and bad years. 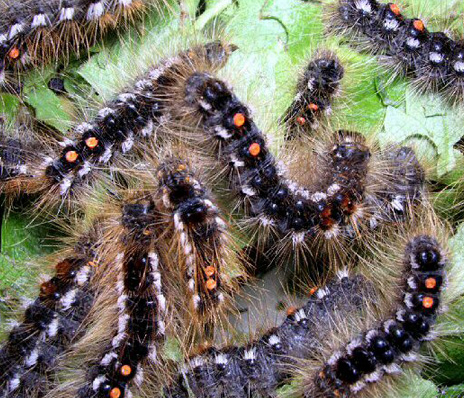 In good years, the moths will make dozens of nests (“tents”) in bushes and shrubs all over the Downs, with each nest containing dozens of hairy little caterpillars. The hairs on the caterpillars can cause a stinging rash (a bit like nettles), and if inhaled can apparently be a nuisance for people with asthma and similar breathing difficulties. If all the caterpillars successfully pupate, emerge and repeat their breeding cycle, it could make the Downs unpleasant for any people who are particularly sensitive to the mild irritation they can cause. An hour of your time, on Saturday or Sunday morning. You’ll need a pair of gardening gloves (to protect you from the caterpillars’ hairs and the spiky bushes they live in), a pair of secateurs or similar, and a bucket to put the tents in. It’s a good idea to have a hand-held sprayer filled with a mild detergent solution to squirt them with – this stops them all jumping out of their tents when you get near them. Then we’ll just chuck them in the sea – a lot safer and sounder than burning them! and I’ll sort out the best time for the most people. We’ll be concentrating on the eastern end of the Downs, by the Reculver Drive car park. Unbelievable ! In these supposedly more enlightened times you are proposing to kill off a native creature because they might be a mild irritant to some people.Might I suggest that the people who ‘ might ‘ be irritated by these creatures avoid the area instead. Shame on you. I have a lot of sympathy with what you say, Denis, but here’s the problem. If people do have an allergic reaction to the caterpillars, the Council’s preferred response is to destroy the blackthorn on which the caterpillars live. That removes a valuable nesting site for a number of birds and also an important early-season source of food for birds and insects alike. We suggested that we put warning signs on the Downs saying "don’t touch the caterpillars – it might not agree with you" (or something along those lines! ), but the Council told us not to. I really don’t like the idea of removing the caterpillars, but I think that’s a lesser evil than having the Council grub up all the blackthorn (which they have suggested many times as the solution). Is there a better option that you can think of? Yes, if you’re in any way allergic to the caterpillars then keep away from the Downs and if the council are removing Blackthorn for this reason then contact the Kent Wildlife Trust who will sort out the council very quickly.